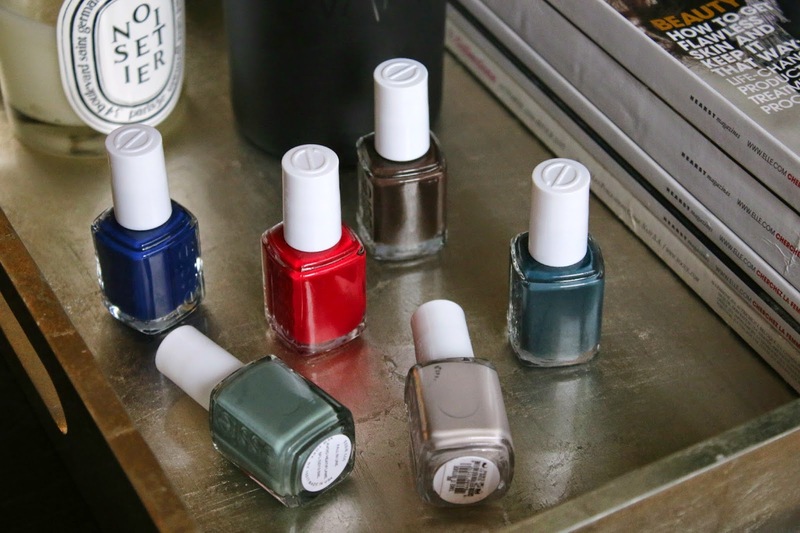 I get excited for a lot of different nail polish launches each season, but Essie is the one brand that always seems to get it right. They consistently make classic colors that become cult favorites that all of us will wear for years and years. And I love the fact that most of the shades they release each season become permanent so you don't have to fall in love with a color and then buy 25 bottles of it because it will disappear after the season is over. This fall collection is everything I would have expected from Essie - rich deep blues and browns, two neutral shades that I can't help but love and a classic red that seems suitable for any time of the year. Below are all the swatches and corresponding names. My personal favorite is 'Take It Outside', as I'm sure all of you guessed. Though it doesn't sound appealing, I would describe it as the perfect mushroom shade - right? A good mix of gray and beige with no shimmer. I need another neutral nail polish like I need a hole in the head but I refuse to listen to reason when it comes to nail polish. What shade is your favorite from the collection? Gorgeous shades! They're so Autumn appropriate! They are! Essie always does it right!